In recent years, companies such as U.S. home financing giant Freddie Mac, German enterprise software firm SAP, and Alliance Data Systems, a Texas-based provider of marketing, loyalty, and credit solutions, have made headlines for their commitment to employing individuals with autism spectrum disorders (ASD), often in jobs of a technical nature, such as creating apps, software, and computer games. “It’s often extremely difficult for those with ASD to find employment, so this phenomenon is helping to push the envelope forward in thinking about individuals with autism filling these positions,” says Jennifer Plumb, DSW, LSW, outreach core director of the A. J. Drexel Autism Institute at Drexel University in Philadelphia. According to Kathryn Parsons, CEO of LaunchAbility, an organization that helps clients find and maintain competitive employment matched to their abilities, “Our partner employers, including companies such as Alliance Data, have told us over the last 30 years of our history that hiring people with disabilities is truly a win-win for everyone.” Employment “offers independence, stability, and a sense of purpose to the employee,” she says, “while the employer gains dependable and eager employees as well as positive advancement to their business culture.” What’s more, challenges for people with ASD can be transformed into strengths in the workplace, she adds. Hyperfocusing, for example, may result in superior productivity and work speed. What accounts for this marriage of unique skills with employer demand? While some people with ASD have characteristics or traits that may make them more adept than others at jobs in technology, the core criteria is a specific interest in the work, Gassner says. Secondarily, tasks involved in the technology workplace often involve a clear-cut right and wrong, an end point, a reliance on facts and logic, and a need for focus and independent effort, aspects that are good matches to many people with ASD who may not be adept at multitasking but who excel in linear thinking and can achieve exceptionally deep and sustained focus and highly visual thought processing, according to Wheeler. Even when an interview leads to employment, many with ASD may not last through a probation period because they lack interaction skills, Wheeler says. They may not make eye contact well, fail to get information from looking at people, or cannot easily understand nonverbal messages such as gestures and facial expressions, she says. Supervisors or coworkers may feel uncomfortable around them and may judge them as rude, insensitive, aloof, uncaring, or incapable of understanding when they merely process information differently, she adds. These characteristics have nothing to do with their ability to perform a job well suited to them, Parsons says, adding that the biggest challenge is overcoming the perception that people need to appear and communicate like the majority in order to be effective at a job. Another challenge she points to is the fact that many jobs now require multiple skill sets rather than singular focus. Companies are missing opportunities by trying to make every person fit all necessary tasks instead of defining jobs in order of best skill match, Parsons says. Social workers can assist their young clients with ASD from the start by helping them think about employment from an early age so that it becomes part of their high school curriculum, Plumb says. They must focus not only on helping clients get a job but on clients functioning in a job, navigating workplace issues, and practicing skills to overcome challenges, she says. 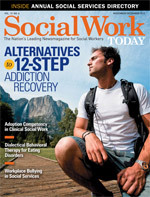 Wheeler says employers may need to make certain modifications, adaptations, and allowances to enable and encourage individuals with autism to thrive in the workplace, and social workers can help clients understand their strengths and liabilities, become self-advocates for any necessary accommodations, and identify what skills they need to develop. According to Gassner, social workers also can assist employers in understanding that they may need to realign their means and manner of communication. “The presumption of understanding expectations is a huge challenge. Supervisors often presume more understanding than is actually present,” she says. Wheeler notes the importance of exchanging information in environments that don’t impinge on the senses. She says discussions should be held in quiet places, and lunch meetings or learning sessions may be counterproductive if held in cafeterias where sensory overload from noise, movement, and smells may be disturbing to employees with ASD. Parsons agrees that many with ASD need simple accommodations, including off-hours scheduling, telecommuting, reduced-noise environments, secluded work space, permission to wear headphones for concentration, advanced prep time for meetings, and written instructions or a checklist to accompany verbal instructions. Gassner points to the importance of ongoing and intensive services to help clients sustain employment and cope with social aspects, which also are key to job maintenance. “Expecting people with ASD to attend team meetings, lunches, and ‘after-five’ events can be overwhelming,” she says. Supervisors need training to ensure that they understand the unique needs and gifts of employees with ASD, she explains.